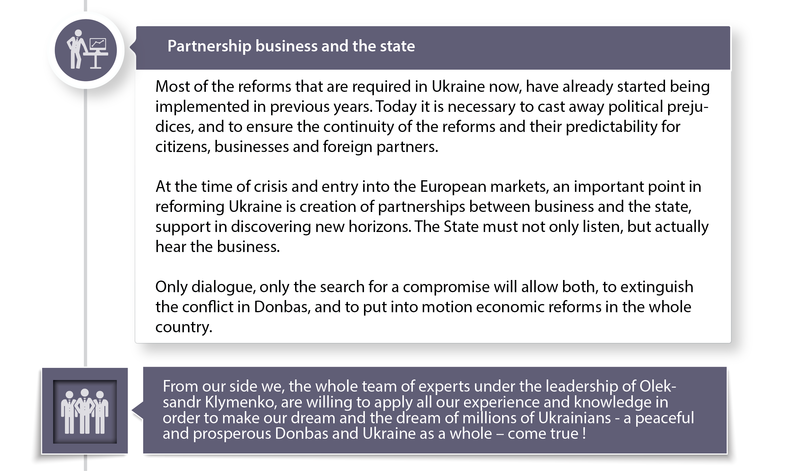 Most of the reforms that are required in Ukraine now, have already started being implemented in previous years. Today it is necessary to cast away political prejudices, and to ensure the continuity of the reforms and their predictability for citizens, businesses and foreign partners. At the time of crisis and entry into the European markets, an important point in reforming Ukraine is creation of partnerships between business and the state, support in discovering new horizons. The State must not only listen, but actually hear the business. Only dialogue, only the search for a compromise will allow both, to extinguish the conflict in Donbas, and to put into motion economic reforms in the whole country. From our side we, the whole team of experts under the leadership of Oleksandr Klymenko, are willing to apply all our experience and knowledge in order to make our dream and the dream of millions of Ukrainians – a peaceful and prosperous Donbas and Ukraine as a whole – come true!